Le Bonne is located in New York City, don’t miss this rich and robust French Onion soup. Slowly caramelizing onions is the key to making delicious french onion soup. 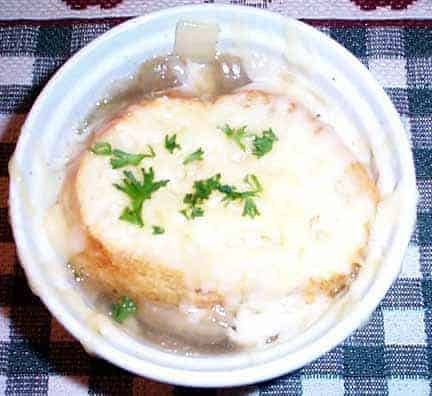 Enjoy Le Bonne French Onion Soup at home. Prepare onion mixture: . Cook onions and sugar in butter over low heat until onions are lightly caramelized (about 20 - 30 minutes). . Add wine. Increase flame to medium and cook until wine is reduced by half (about 5 minutes). .
Add broth, celery, salt, and pepper. Bring to boil over high flame. . Reduce heat to low, partially cover, and simmer for approximately 40 minutes. . Remove celery; discard it. .
Add sherry; simmer 5 minutes longer. -- Prepare baguette-topped soup: . Preheat oven to 375 degrees F. . Lightly toast each slice of baguette. Set aside. .
Place soup bowls on jelly roll pan or cookie sheet. . Put jelly roll pan or cookie sheet (containing empty soup bowls) on center shelf of oven. . Pull out shelf (so that you can fill the soup bowls). . Ladle soup into 4 individual oven-proof soup bowls. . Top each soup-filled bowl with one toasted slice of baguette. . Sprinkle 1 tablespoon cheese over top of each bowl. . Push back oven shelf. . Heat until cheese melts and bubbles (approximately 5 - 6 minutes). We loved this soup! It was easy to make which is a must for our family, we are always busy!